FOR most bobbies on the beat, few patches can seem more challenging than the hideaway corners of Camden Town, well known to dealers looking to stash their loot. But one copper who wasn’t put off by the apparent uphill battle against drugs is PC Lee Janes. A member of the Safer Neighbourhoods Team covering Camden Town and Primrose Hill since he joined the Metropolitan Police five years ago, PC Janes is so committed to his job that last year he often spent hours guarding the same streets after his shift had ended. His unpaid overtime resulted in accolades, including being shortlisted for Community Constable of the Year – whittled down from thousands in London – and a commendation from the Met’s Assistant Commissioner. The scheme to clean up Inverness Street has been nominated for a Problem Solving award, due to be drawn in February. His hard work also saw 10 Asbos handed out against a cannabis-dealing Somali group known to police as the ANC gang. Speaking to the New Journal as he walked his beat last week, PC Janes was given a heroes welcome by traders and stall-holders, grateful for the work he’s done to cut crime. PC Janes said: “All of those Asbo’d have been banned from Camden Town and they’re not allowed to associate in groups of four or more. He said his team tried an unorthodox approach when working with the Somali youngsters, from taking them home and talking to their parents to getting them involved in youth clubs and obtaining help from the council. On first-name terms with many of them, PC Janes had a “good relationship” with murdered Swiss Cottage student Mahir Osman, and was one of the first officers the detectives turned to. 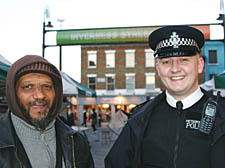 Inverness Street is now something of a “job done” and PC Janes’s torchlight is shining on dealing around Camden Town Tube – which he says is not as prevalent as people perceive. With an increase in numbers based at the Greenland Road station in Camden Town and another 30 down the road in Kentish Town, PC Janes hopes there will be fewer places for dealers to hide in future.